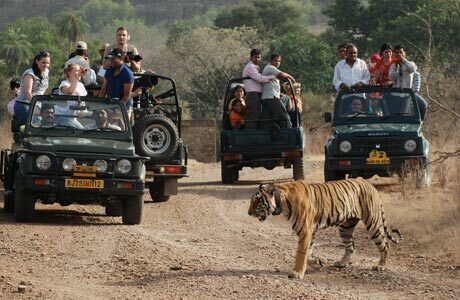 Wildlife and Classical India tour is a collection of two contrasting facets of the country. 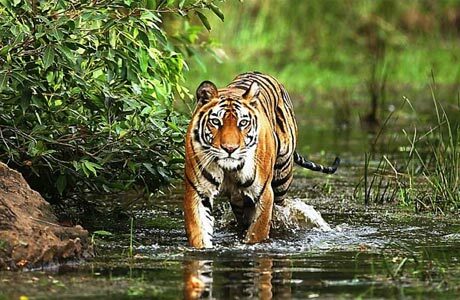 One aspect concentrates on the rich wildlife bounties of the country resting in Kanha, Bandhavgarh and Bharatpur. The classical side of this country can be viewed through the architectural specimens at Khajuraho, Agra and Jaipur. In all this is another wholesome itinerary bringing the best of both worlds in India. Upon arrival in Mumbai, meet India Budget Tours representative for assisted transfer to the hotel for overnight in Mumbai. Take off via flight from Mumbai to Nagpur. 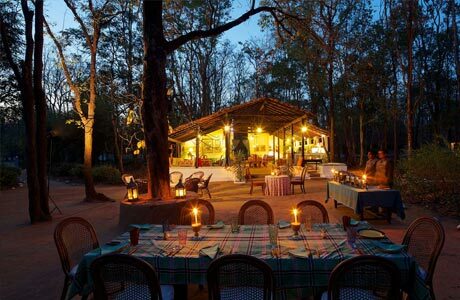 Upon arrival in Nagpur, hop in the car for a journey towards Kipling Camp in Kanha National Park for a three-night stay. Early morning, begin a safari atop the open jeep and spot the wondrous wildlife in the park. Also, visit the local market and ride the elephant. Even scrub the mighty elephant's back in the river. Spend the evenings sitting around the campfire listening to the noises of the jungle. 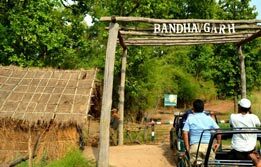 Check out Kanha and begin a drive to Bandhavgarh. Upon arrival, check in the hotel. 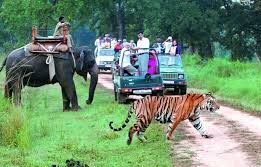 Begin jeep safari accompanied by a forest department guide in the noon.Overnight in Bandhavgarh. Early morning, begin game safari atop elephants into the jungle for tiger tracking. 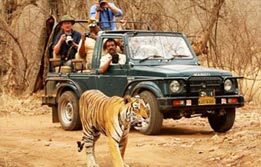 In the noon, begin jeep safari.Overnight in Bandhavgarh. Early morning begin a jeep safari in Bandhavgarh to bid adieu to the National Park. After breakfast, check out Bandhavgarh for a drive towards Khajuraho, a city of living temples built during the Chandela period. Upon arrival, check in the hotel for overnight stay. Devote this morning towards sightseeing of Khajuraho where one gets to see 25 sculpted temples. The temples are in three groups, western, eastern and southern complex over an area about 8 square miles. 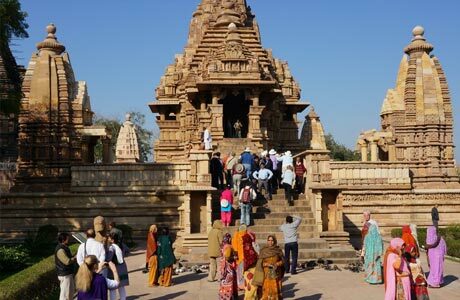 The western group is the largest and most important; the eastern group is dedicated to Brahmin and Jain shrines close to the present Khajuraho village and the Southern group houses the Chaturbhuj temple. In the evening, view the light and sound show and travel back in time in testimony of Khajuraho temples. Overnight in Khajuraho. Late morning, check out Khajuraho for a drive towards Jhansi. While on drive, visit the ancient palaces and temples of Orchha. Board ‘Shatabdi Express’ to depart Jhansi at 17:55 hrs arriving into Agra at 20:00 hrs. Upon arrival, meet India Budget Tours representative for transfer to the hotel for a two-night stay. 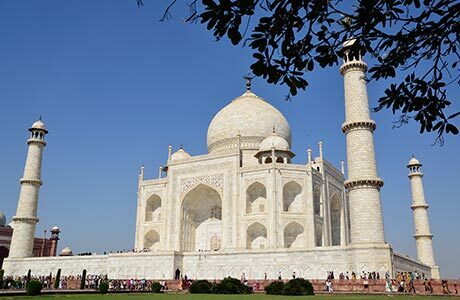 Begin the day with a visit to the Taj Mahal in morning. It is an acclaimed architectural masterpiece and one of the wonders of the world. 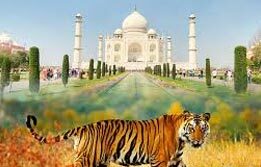 This sublime garden-tomb of Mumtaz Mahal and Shah Jahan is now an identity of India in terms of its architectural grandeur and excellence. In the afternoon, visit Agra Fort and Tomb of Itmad-ud-Daulah. Overnight in Agra. Check out Agra for a journey towards Bharatpur, the home to one of the most famous bird sanctuaries in the world. Enroute visit Fatehpur Sikri, Akbar's architectural vision in reality. Still the city, due to abandonment is in excellent state of preservation. Upon arrival, check in the hotel. Rent a rickshaw for a great bird watching experience in Bharatpur. During the afternoon, explore Bharatpur with a visit to the Government Museum and Lohagarh Fort. Overnight in Bharatpur. Morning begin an excursion to Amber, the capital of Kachwahas. 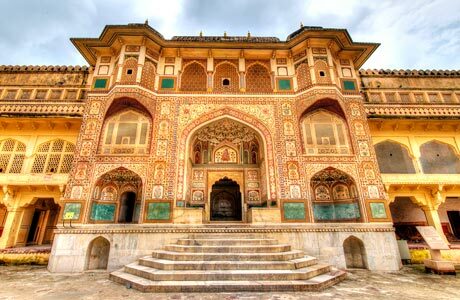 Located on the rugged hills that surround Jaipur, this is a jovial attraction of Rajasthan. Here, in order to ascend the royal hilltop, one needs to sit atop colourfully painted elephants. Here, tourists also admire the massive gateways, courts, stairways, pillared pavilions and palaces that recall the glory and wealth of Amber's association with the Mughals. In the afternoon, visit City Palace, still a home to the erstwhile Royal family; Jantar Mantar, the Royal Observatory and Hawa Mahal, Palace of Winds, built for the royal ladies to observe the activities on the street below without being seen. Overnight in Jaipur. Early morning drive to Delhi. Upon arrival, check in the hotel. 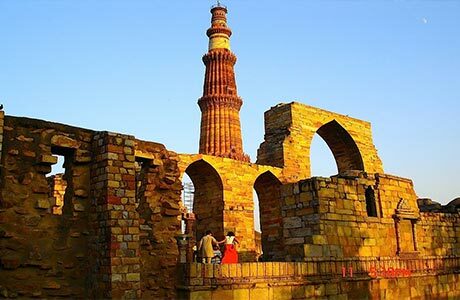 After lunch, begin the discovery of Delhi with a visit to Qutub Minar, Red Fort, Jama Masjid and Humayun's Tomb, the only monument ever built by a lady in the memory of her beloved husband, which was an inspiration for Taj Mahal.